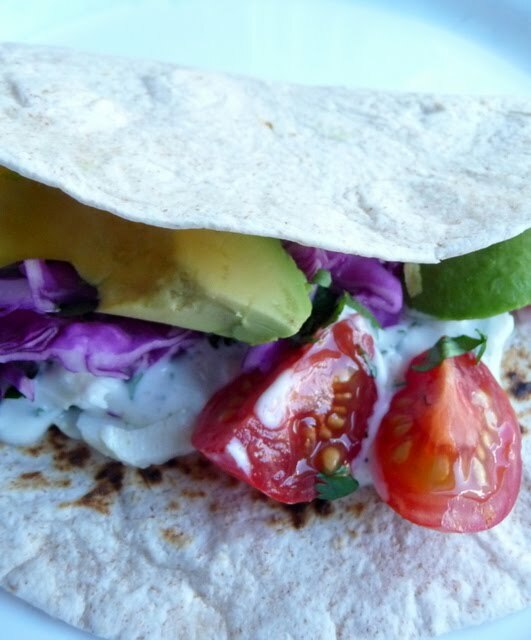 Can you believe I have never had fish tacos before I made these? I know – I can’t believe it either. I had no idea what I was missing or how much I would enjoy them! They were also so super easy to make – I had dinner done in no time at all. I used cod for mine – but you can use any type of white fish that you like – halibut, tilapia, etc. They are no only delicious – they are healthy too - I’m really looking forward to making these again soon! 1. Combine the lime juice, 2 tablespoons of the olive oil, cilantro, cumin, and garlic in a shallow dish. Whisk together until well blended. Place the fish in the mixture, turning to coat. Let marinate 15-30 minutes. 2. Meanwhile, prepare the cilantro cream sauce. Combine the lime juice, cilantro, greek yogurt, garlic and pepper in a small bowl. Mix until well blended. Refrigerate until ready to use. 3. Heat the remaining 1 tablespoon olive oil in a large skillet over medium-high heat until shimmering. 5. Remove to a plate and season with salt and let rest for a few minutes. Shred the fish into bite-sized pieces with two forks. 6. Assemble tacos on flour tortillas with shredded fish, cilantro cream sauce and toppings as desired. Oh, yum! My husband has been begging for fish tacos lately. I'll have to try this out!